The best illustration I heard on this concept goes like this; Imagine your on top of a 20 story building, and there is another 20 story building across the street 100 feet away. Let’s say your offered $100 to walk across a 2 inch wide beam to the other building. would you do it? Assuming you don’t work in the circus, I imagine your answer is no. What if your child is being held hostage on the other side, and your told the only way your child will be spared is if your willing to walk across the beam to the other side. You will find many more people willing to face their fears at this point. Their dream, that of saving their child, is big enough. In the same way, you have to develop a dream big enough that is bigger than the obstacles that will show up on your route to success. The best way I’ve learned to describe this, is that you need a dream that is bigger than any obstacle that may stand in the way. 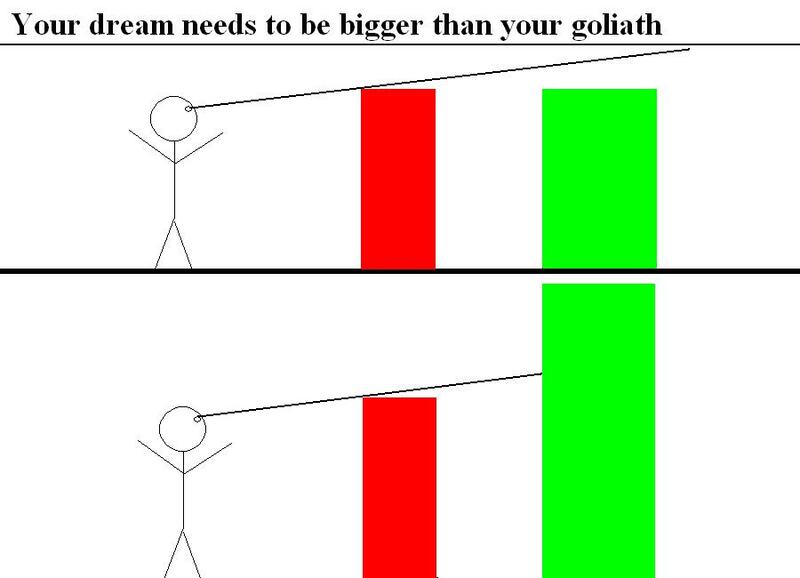 If the dream is too small, you will not be able to see the dream anymore and you will start making excuses that the price is not worth it, like in the image below. If there is one thing I’ve learned in the last year, it’s that, as Orrin Woodward says, ‘Success never goes on sale’. This thought scares a lot of people, and leads them to decide that since the price of success may be high, that it’s just not worth it. Many people are waiting for something to come around and fall in their lap, but I have not yet seen this happen. Sure, you will come across those people that win the lottery, or get a nice inheritance, or some similar easy money deal. I personally don’t see this as true success, because in many of these cases, the money doesn’t stick around. What is the percentage of lottery winners that are broke 5 years later? How many of these people have everything they want out of life and are truly happy? The other thing I’ve learned about success, and truly believe, is that it’s worth the price. I love what Claude Hamilton says, that the biggest lie most people tell, is that success is not worth the price. I have yet to achieve the levels of success like those of Claude Hamilton or Orrin Woodward, but I can’t even begin to imagine that the obstacles I’ve had to overcome, and will continue to come across aren’t worth overcoming. So how do you develop the dream? That is part of the other principle of success that I will talk about here. It is the other great idea that I’ve been learning about, and applying to my life. It can be summed up the with this process: Define – Learn – Do. You first have to define what success is for you. This process can be applied to any particular area of your life, or life in general. To have the most success, I would suggest taking this principle to life in general, and be as successful as possible in all the different areas. Forget about your current circumstances and imagine… if time and money were not an issue, how would your life look when it comes to your family? In terms of parents, siblings, spouse, and kids. How are your relationships with these individuals? Same thing when it comes to friends; would you keep the friends you have now, would you want others? more? How would you like to be treating each other? What about Finances? how much money would you like to have coming in on a weekly or maybe yearly basis? how much money would you like to have saved up? In Fitness, how would you like to look? What kind of shape would you like to be in? What about fun… what would you like to be doing? travel? where would you like to go? There are many other categories in life that this process can be applied to. Once this is defined, you can use this to start building your dream, by going into the specifics. The next part may not be easy for some people, but there are ways to do it. That is the ‘Learn’ step. Once you have defined your lifestyle you want, or your dream, find someone who has those results and learn from them how to get what they have. This is not easy in today’s world, with many people out for themselves, and worried that, in business at least, you might become their competitor if they teach you to much. There are organizations out there however for which this is not the case, and there are people that will be more than willing to share that knowledge with you. The key, however you do it, is to learn the right steps to get what you defined. I have found a great organization that is providing me with everything I need to know, and I’ve decided that I’m going to get what I want by doing the same thing and helping other’s get what they want. The last part is the real key. It’s the ‘DO’. You can define all you want, and learn everything you need to know, but if you don’t go out and actually do what needs to be done, then all the previous steps will be for naught. The best thing to do, after learning from those that have what you want, is to do what they did. It’s kind of like the principle of franchising. When someone opens a McDonald’s or a Tim Horton’s, they will have usually defined what they are hoping to get out if it (with how much it costs these days there MUST be something to get them willing to pay that much for the opportunity). What they are doing next is learning how to run the place from people that have developed the system which makes it successful. Once they have gone to whatever training is required, they then go to their new restaurant and do what they learned, leading to success (usually) based on a previously developed system. The Define-Learn-Do process works in much the same manner, but applied to any area in which you want success. I have yet to completely define my dreams, it’s a work in progress. What I can say though, is that the more I’ve been working on it, the more I have grown, and the more the business I’ve started has grown. Nothing was happening until I first started working on my dream.